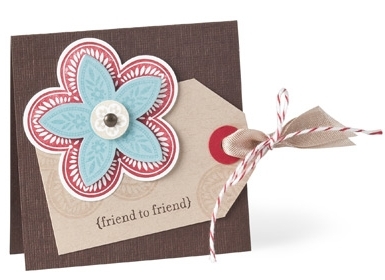 Use our boldly designed and delightfully detailed Triple Treat Flower Stamp with the Fancy Flower, 5-Petal Flower and 1/2" Circle Punches to create this non-traditional "friend to friend card". Such effortless coordination makes sophisticated design quick, easy—and fun! Look carefully: our triple treat flower offers three unique designs. Best of all, you can get this set FREE with a $60 purchase during Sale-A-Bration!